Advance warning: this is a long post! Perhaps you have seen on my Instagram- I started Whole30 on March 21. The reason was initially two-fold. First, I have been experiencing SI joint/lower back/hip/IT bands pain for over 2 years now. I went to a few different doctors, tried PT twice, had 3 cortisone shots (one worked well for the right side but the left continued to nag), icing it, putting heat on it, countless stretches... yada yada. Nothing worked beyond a brief reprieve (sometimes a few days, sometimes just hours). I decided to try acupuncture where she introduced and suggested Whole30 to me. Second reason is, also at that time (this is mid-late February), I was experiencing hives on my body. Long story short, I used to get hives in college and there is a hereditary aspect. It's not caused by anything external and can be a real nuisance, deterring my life (I tend to get them on my face). We began to put the pieces together that I may have some inflammation issues that are irritating my SI joint/lower back/hip/IT bands and causing the hives. Enter Whole30. At first, I was super overwhelmed. I read some of the book, It Starts With Food, was on the website looking at what I can and cannot eat, Pinning recipes, reviewing tons of shopping lists, and panicking a bit. My mom decided to do Whole30 with me and together we talked about our strategy. Planning the 30 days out with her and reading this blog post, put things in perspective for me. Keep it simple, really resonated. I didn't need to be all fancy and make elaborate meals with tons of ingredients (which I am not comfortable with when I cook, Whole30 or not). I just need to focus on protein, veggies, and fruit (and not eat grains, gluten, dairy, alcohol, legumes, beans, sugar, etc. according to the official Whole30 rules). Sure, I can do that. Here my little weekly review diary (which I updated every few days so the past/present tense might be off). Week 1 review (Sat, Mar 21-Sat, Mar 28): My first 2 days were fine. My non-flavored coffee with some canned coconut milk took some getting used to. I found myself feeling bloated around day 3-4 and pretty sluggish come the late afternoon. In the timeline, they say the first week is the "hangover" stage of your body getting used to not having sugar, carbs and the other stuff I was typically feeding it. I enjoyed eating an entire avocado for lunch and feeling no guilt! I get a bit OCD with my weekly meal plan to make sure I was eating on plan and correctly. I hope that "panic" subsides as I get into week 2. Week 2 review (Sun, Mar 29-Sat, Apr 4): Sunday night I had a dream that I ate all the things and ruined my Whole30. Luckily it was only just a dreammm (sing it Nelly). The week went by well and I am no longer a slave to my meal plan, feeling more at ease with what I am eating. At acupuncture on Thursday, I felt a significant difference with my left SI joint and IT band pain decrease. Winning! I think my clothes are fitting better? I do feel leaner in the rib cage area. Come Friday and Saturday, I just wanted to go out to dinner and have a glass of wine. I find these days to be the hardest. Week 4 review (Sun, Apr 12-Sun, Apr 19): Sunday I felt really good knowing that I just had 1 more week. The dreams have been intense where again I am eating everything, especially pizza! I still feel less pain in my left SI joint/lower back which is great. I feel leaner around my face and rib cage. Sunday aka DAY 30(!) I went to a blogger shopping event and was down a size. Coincidence? I think not! I haven't weighed myself and won't 'til I am at the gym on Wednesday. When I ate meal 3 on Sunday, it felt surreal knowing that 30 days were done. But no rest for this Whole30-er as in theory it continues for the next 10 days with reintroduction. Parting thoughts/a few other things to note/next steps: Throughout the 30 days, I didn't feel a huge difference in sleeping habits, skin clearing, or overall energy (besides the hangover phase sluggish-ness), like many have experienced. Also, I didn't lose too much weight (6 lbs) but did feel leaner and some of my clothes fit better. I really missed the ease of whipping up something easy for dinner. I have never used so many Tupperware containers and was running the dishwasher a lot more. Things I missed the most were cheese (so many dishes I made I thought to myself, "oh this would be sooo good with cheese on it"), wine, chai tea lattes - hm what does this say about me? I am glad I did this and it really did change the way I view food, food shopping & choices, and how I cook. I am going to continue to eat mostly Whole30 and limit my gluten intake. I plan to do Whole30 again after the summer and see how I feel. Thanks for reading if you made it this far! Tomorrow, I will share 5 Whole30 food favorites. 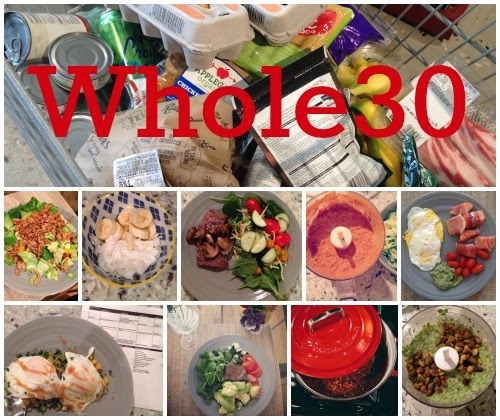 Has anyone does Whole30? I'd love to hear about your experience. so I dabbled in whole30 back in March and I had a similar overall experience. I didn't have any pain or health issues but i was grossed out with myself. I also didn't stick with it for 30 days because of spring break but I'm really glad I did it and continue to use the guiding whole30 principals. I also think cheese would be good on EVERYTHING. nice job!